We provide a blog to keep customers up to date on news about our company, products, and the industry at large. This week, we're talking about the Heated Air Jetting that we offer on our tubs, and the air jetting offered in the industry in general. We'll take a look at the benefits of air jetting and what to expect from an air jetted tub, internal vs. remote air blowers, and what type of safety technology is incorporated in our designs, all in our latest knowledge base article: Heated Air Jetting. You can find the article at this link. This week, we're excited to announce the latest design from The Tub Studio: The Capua. 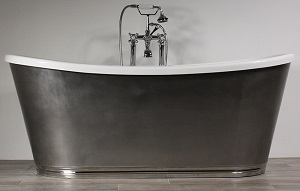 The Capua features a hand burnished stainless steel skirt, and comes with a Penhaglion No.97 freestanding tub filler. As with all of our tubs, the Capua is a complete package including all fittings, a faucet and a drain. The Capua is supplied with chrome fittings, however Brushed Nickel, Polished Nickel, Oil Rubbed Bronze, Unvarnished Brass, and Satin Black can be specified for all of the fittings at no extra cost. The Capua is a French Bateau shaped tub and features our narrow rolled lip for the rim of the tub. The bottom of the skirt is accented with a "C" shaped cutout that runs around the circumference of the skirt about an inch and a half from the floor; this part of the skirt is finished in a mirror polish to contrast the burnished steel. You can find out more about the Capua on its product page, located at this link. During the time I've spent in this industry, I think I've heard everything anyone has to say about the merits of cast iron or acrylic tubs; you can get an opinion about it from almost anybody that's dealt with them, and it's important to keep quality in mind if you want to draw valid comparisons. Naturally the user experience of a low quality acrylic tub won't compare to a high quality cast iron tub; we only sell the highest quality in acrylic tubs and when you compare quality for quality, I think many of the differences between the two amount to personal preference. There's no doubt that an acrylic tub is much easier to install and handle because it's much lighter, but some people just prefer the "feel" of the iron. We get into more depth about the issue in our newest article, Cast Iron vs Acrylic Clawfoot Tubs. This week we're taking a look at the different styles of clawfoot tubs on the market and how to choose the one that suits your needs. Selecting the style with the most aesthetic appeal to you is the most straightforward step, but sometimes the practical considerations can make the difference if you're on the fence between two or more styles. We're breaking everything down for you in our newest article, How to Choose a Clawfoot Tub. Currently gracing the number one spot in our homepage slideshow is the Cosimo - A "Swedish Slipper" style clawfoot tub available in 54 inch and 58 inch sizes. The Cosimo features Tub Studio's "Medici" Clawfoot, and comes with a Penhaglion No.97 freestanding tub filler. As with all of our tubs, the Cosimo is a complete package including all fittings, a faucet and a drain. We chose to supply chrome to complement the Iron Grey exterior finish of the tub, however Brushed Nickel, Polished Nickel or Oil Rubbed Bronze can be specified for all of the fittings and feet at no extra cost. The shape and feet being quite transitional, we wanted this to be a tub that brought a contemporary edge to a classic design. The lip of the tub is sleek looking narrow, rolled lip which, paired with a refreshingly cool color palette, bring a timeless design into the modern era. You can find out more about the Cosimo on its product page, located at this link. When we founded Tub Studio, we realized that we were starting a company that would make it's own way in a very dynamic and constantly changing industry. We wanted an outlet where we could apply our experience in bathroom and bathtub design creatively, and provide fresh products in an area of the market that we feel has become quite predictable. There's a challenge in starting any business, and that challenge is magnified when you step outside of convention; Tub Studio was founded to offer unconventional products, and an unconventional level of customer focus. We are dedicated to provide both innovation and customer service, and we feel that keeping customers up to date on our company is an essential part of customer service. We established this blog to keep you, our customer, informed not only about the Tub Studio and its products, but to provide interesting content about bathroom and bathtub design. We hope you will find it useful and entertaining, and look forward to serving you.